I am 33, male. 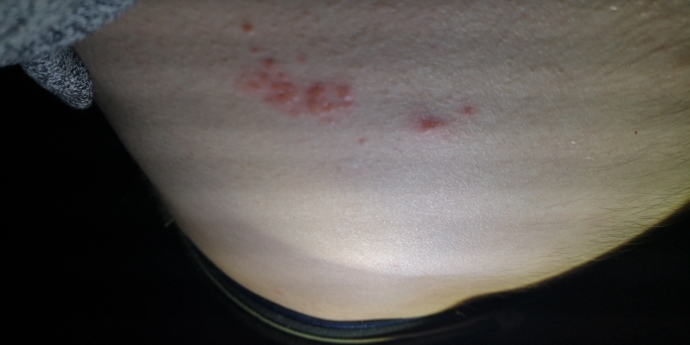 I noticed these bites/bumps/blisters on the right side of my abdomen on Sunday the 10th (and they haven't changed significantly since). It is now Thursday night. I only noticed them in the afternoon at the gym.... I would think they had not been there long. They are still there. They are not really itchy... most of the day I totally forget I have them. They only itch very slightly a few times here or there, really only if I think about it lol. They are not painful. Thinking about it now, a one moment day or two prior to my noticing them I may have been itchy in that spot for a few minutes, but it's hard to remember as I thought nothing of it. Nothing that stood out. This past summer, I also had this some mystery bump/bites at around the same spot... and nothing since then (so, probably 7 months with nothing that I noticed). I feel fine - no secondary symptoms that I know of. From what I understand shingles would present with at least something other than just the visual marks...? Any ideas about what this could be? I would really appreciate advice. Thanks ever so much! looking at the photos they look like blisters going by their appearance they look like shingles to me. thats how my rash started and then progressed. do not itch them do not touch them the blisters fill with contagious puss and will spread virus more. go to the doctor and get checked out and get acyclovir tablets to combat the virus and to dry up the rash into yellow crusts and scabs do not pick them. i suffer reocurring shingles on my face. thank you for the response. What about my situation being one of not having any other traditional shingles symptoms though? 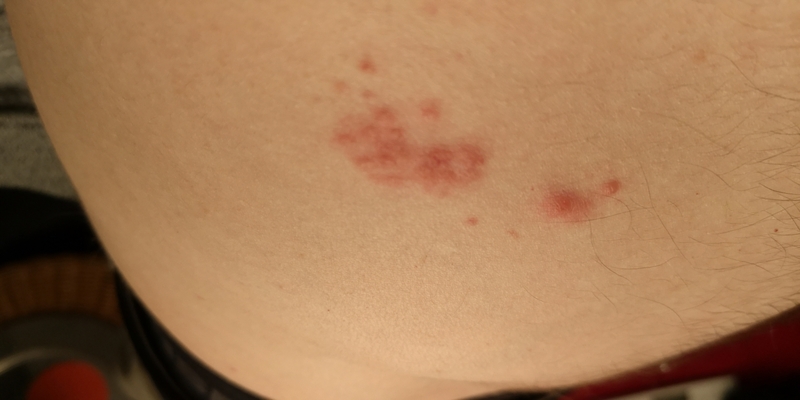 Would that suggest this might not actually be shingles, but could be something else instead? Most cases of shingles cause severe pain and itching, and can leave scars. Fluid-filled blisters develop, break, and crust over during and a few weeks after an outbreak. You also may feel sick or fatigued, with a slight fever or headache. However, it is possible to have rashes that are so mild they're not even noticed. my advice would be to go to doctor though just to be on the safe side. swollen lymph nodes adjacent to the rash. I would still see a physician for a diagnosis. As you may very well have shingles, recurrent, you would need to explore the possibility of the Shingrex Vaccine (highly efficacious) if you are in the US, as you are eligible here with a note from your physician. If you are in the UK, everyone waits until 70 years of age. Also, Google high Lysine low Arginine diet and Herpes as the amino acid Lysine suppresses the Herpes Zoster virus and Arginine triggers the virus. A small update - I tried going to a walk-in today, but they were all full. I'm in Canada, btw. I literally have had no real symptoms since I first noticed them last Sunday, not fatigue, nothing. A bit of congestion today, but I haven't slept that well, so may be a bit rundown. I googled the diet you mentioned, and as it turns out... that is pretty much my diet! Though I confess I have a bit of a sweet tooth to go along with it. Normally I wouldn't care less about my situation (since it's not causing discomfort) except that I read that shingles increases the risk of heart attack and stroke, particularly if you get it under 40... so that... is concerning. I am quite active as a runner, and I don't want to have that jeopardized. Speaking of, I hope to continue training through this current situation.